> Which Cars Hold Their Value the Best? CanadianBlackBook.com encourages Canadian car buyers to appreciate depreciation when buying a new vehicle. Everyone has heard that the minute you drive off the dealer's lot with your brand new vehicle, it's worth a lot less than what you just paid for it. By the end of the first year, your vehicle will likely have depreciated in value somewhere in the neighbourhood of 20 to 30 per cent. Ouch. Depreciation is likely the single largest expense of owning a vehicle, more than gas, maintenance or auto insurance. However, some vehicles depreciate slower than others, and each year CanadianBlackBook.com announces their picks for the vehicles with the "Best Retained Value." These are vehicles that they've identified as holding the highest percentage value of their original MSRP, over a four-year period. From an overall brand standpoint, this year's award winners include Toyota if you're in the market to buy a car, truck, crossover or SUV; and Porsche if a luxury model is more your style. 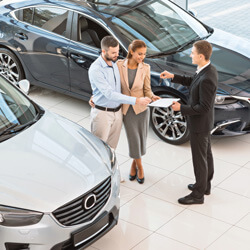 Knowing which vehicles hold their value is certainly one component of making a better buying decision, but so too is knowing how much that vehicle will cost you to insure. Year after year, for the lifetime that you own the car, truck, or SUV, you'll need auto insurance and you'll want to factor this cost into your buying decision as well. Compare auto insurance rates to see which vehicles will help you spend less on auto insurance. At Kanetix.ca, we shop the market to help you get the lowest rate, and no one covers as much of the market as we do. This article is updated annually with the latest winners. View the full list of CanadianBlackBook.com's Best Retained Value Award winners, as well as past winners.